Sometimes when I see a picture, I get this funny feeling, butterflies almost, it's hard to pinpoint what I could call it but its overwhelmingly inspiring...I become totally besotted! Well that's how I felt when I saw this first image. I'm not sure whether its the black and white imagery used on the wall or the pink Eames Eiffel or the fact that I just love any shade of pink and grey. All I know is that I love it! 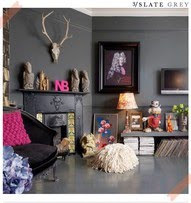 From pastel to 'look at me' bright, pink looks amazing with grey. 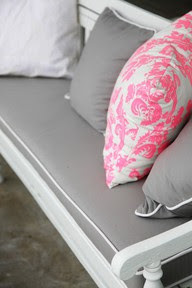 Its the perfect mix of masculine and feminine, glamour and girly, practical and pretty. Don't you just love the combo? how wonderfully feminine. 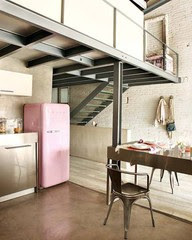 i want to live in all of these! 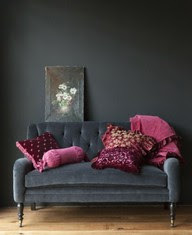 i also love grey and pink together. some colors are just made for each other. Totally not crazy...I feel the same way! It's like how music evokes an emotion, great design does that too :) Love the pics, the first one is exactly how I want my family room! P.S. Thanks for the comment on my blog, I love your blog and I am a new follower as well! I feel the same way too! Love all these photos...many of them are in my inspiration folder as well!! That first photo is just a happy photo because of the children playing. 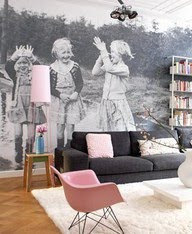 Children bring such life to any room, especially a darling print like that in such a ginormous size. You find such lovely photos around the web. 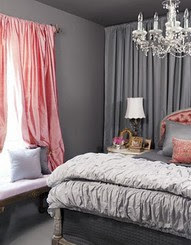 I cannot say how obssessed I am with gray and pink! I love all these images. Beautiful, I love all of them. 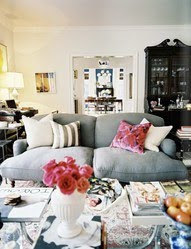 The combination of gray and pink is divine. 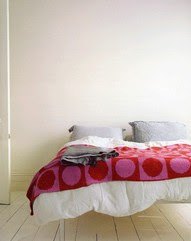 Thanks for stopping by my blog b/c I found your lovely blog! great images. Have a nice weekend! 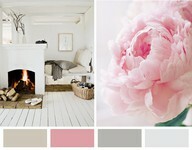 Gorgeous combination two colours go so well together, your so right perfect mix of masculine & feminine. Favourite is the 3rd from bottom beautiful bed! Hello Miss Walker! Thank you for your kind note. I love your blog, and these photos are stunning! I love this color combo. 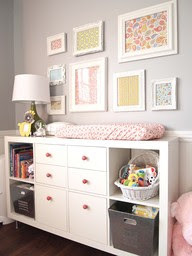 I particularly love yello, gray, and navy together! Thank you for the eye candy. xo - Brooke M.
Love the pink!! Thanks for following my blog - I'm following yours too!